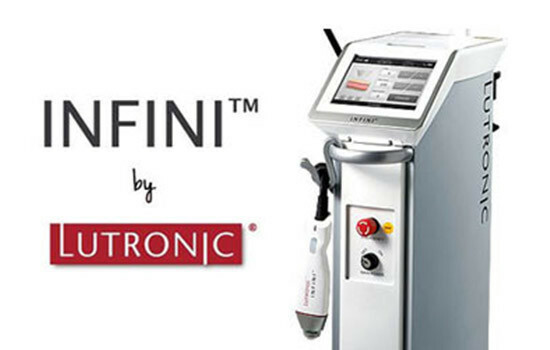 INFINI is a unique technology that puts you in control of your skin rejuvenation procedure. You control the treatment depth and energy levels to enable a multi-layered approach for customized treatments, regardless of skin type or tan. Now you can provide the best solution that will keep your patients returning and referring you to new patients. 1. Superficial Fractional RF (SRF) The SFR (Superficial Fractional Radio-frequency) handpiece provides minimally invasive delivery of RF energy to the epidermis and dermis with its’unique dual channel delivery system. The first channel delivers a deeper zone of controlled thermal effect, while the second channel provides micro-ablation of the upper layers of the epidermis and mild coagulation. Working in combination, the two distinctive channels result in luminous skin, controlled tightening and scar revision. 2. Microneedling Fractional RF (MFR) One of the most distressing skin problems post-acne scarring. Basically, these are depressions in the skin because of collagen destruction by inflammatory acne. Microneedling fractional radiofrequency (MFR) has shown clinically efficient in managing acne scars without causing direct damage to the epidermis. MFR create radiofrequency thermal zones without damaging the epidermis. After damage to the reticular dermis, long-term dermal remodeling, neoelastogenesis, and neocollagenogenesis results in dermal thickening.